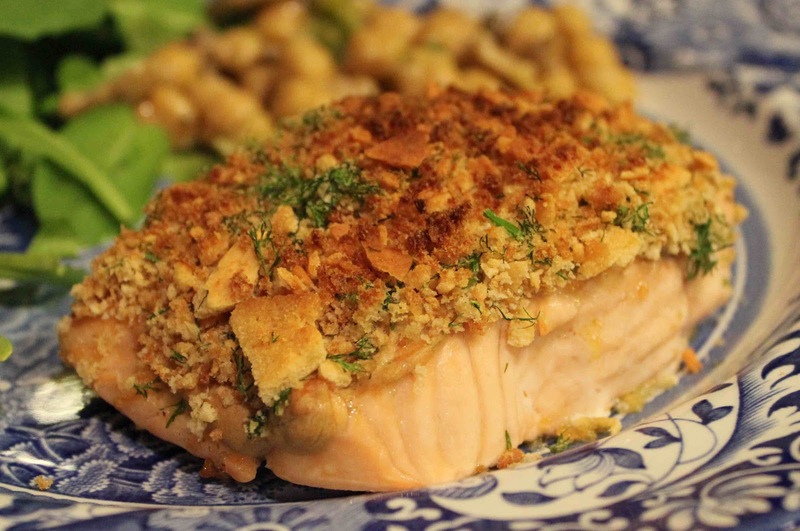 Broiled salmon with mustard and crisp dilled crust is one of my favorite fish recipes… however it nearly cost me my love of baking and my oven! Back when I was first learning how to cook in college, I made some mistakes that I am not proud of. One of those mistakes was catching Easy Mac on fire in the microwave. I know, I know… the word “easy” is in the name, but I forgot to add water!!! The oven rack was only about an inch from the heating element, rather than 3 inches. I put way too much olive oil on the salmon – in fact a pool of oil collected on the aluminum foil…hint, hint – this is what ignited the fire. As you can guess, #1 and #2 from above are what caused the fire in my oven. I remember smelling the awful burning odor from my kitchen, and seeing the smoke seep out of my oven door. As soon as I opened the door, I saw a small flame engulfing the top portion of my oven, and my salmon! 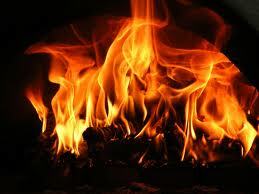 Note: this is a pretty flame…mine did not look like that! If you’ve ever been in a scary situation, you can relate to the same weird, adrenaline-rushing sensation that I felt. I was shaking, everything was moving so fast, and I felt like I was “watching” the scene, rather than taking part in it. Luckily the flame was small enough, that I was able to extinguish the fire with just a juice glass-size of water. My ears were ringing from the smoke detector, but thankfully, it went off before anyone was dispatched. I even salvaged some of the salmon and ate the non-charred portion of it…I was hungry! To this day, I’m still extremely scared of using a broiler (I’m even scared to use an outdoor grill), but I’ve had no accidents since then…”knock on wood”. I hope you enjoy this salmon as much as I did. Obviously I would not be making it after my “accident” had I not LOVED it! The fish is flaky, the bread crumbs are crunchy and crisp, & the the dill is a perfect accompaniment to this extremely flavorful and slightly salted dish. You will feel as if you’re eating at a 5-star restaurant. Bon Appetit! Pulse sandwich bread and pita chips into fairly even 1/4-inch pieces. Bake in a 400 degree oven for 4-5 minutes, shaking once or twice until golden. Mix breadcrumbs with freshly chopped dill and set aside. Rub olive oil, salt & pepper on salmon fillets and broil until opaque. 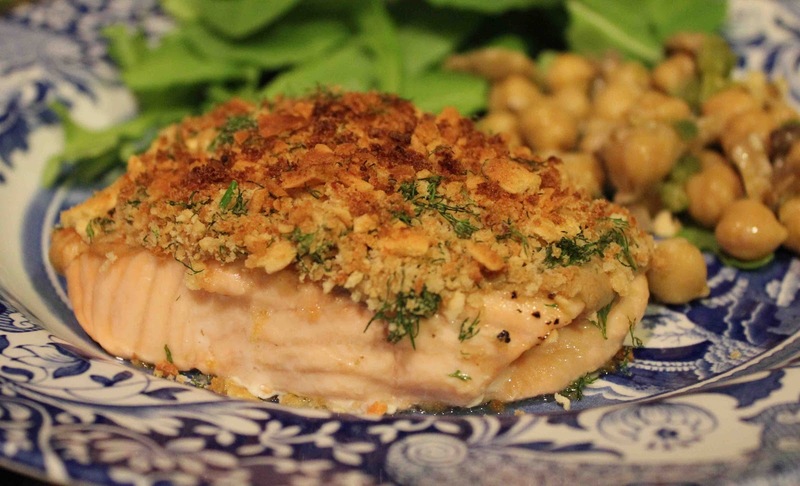 Coat salmon fillets with dijon mustard and bread crumbs. Broil in oven on lower rack until 1 minute longer. 1. Adjust one oven rack to uppermost position (about 3-inches from heat source) and second rack to upper-middle position; heat oven to 400 degrees F.
2. Pulse bread in the work bowl of a food processor fitted with a steel blade until processed into fairly even 1/4-inch pieces about the size of Grape-Nuts cereal (you should have about 1/3 cup). Pulse for about 10 one-second pulses. 3. 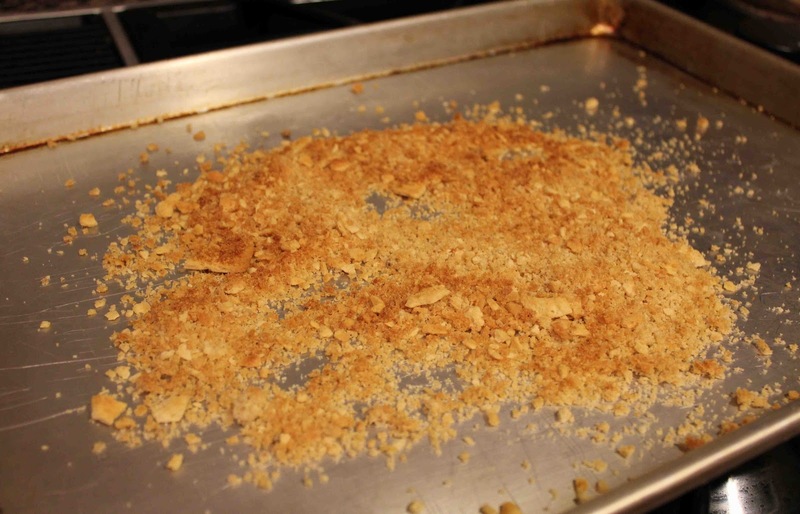 Spread crumbs evenly rimmed baking sheet; toast on lower rack, shaking pan once or twice, until golden brown and crisp, 4-5 minutes. Toss together bread crumbs, crushed potato chips, and dill in a small bowl, set aside. 4. Increase oven setting to broil. 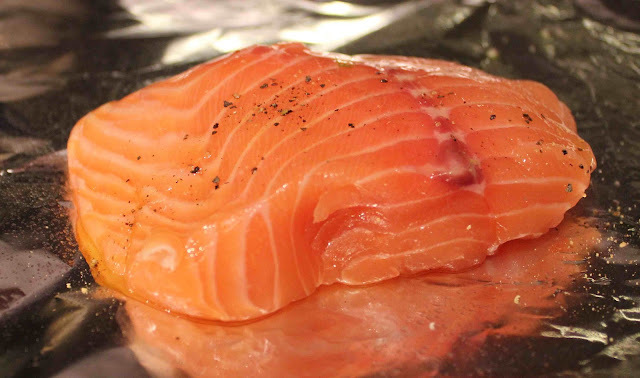 Line baking sheet with foil and place salmon on foil. 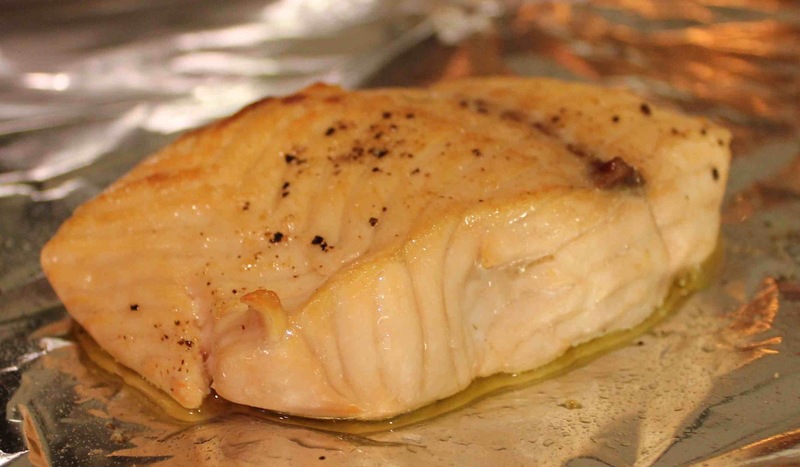 Rub each fillet evenly with 1/4 teaspoon oil; sprinkle with salt and pepper. Broil salmon on upper rack until surface is spotty brown and outer 1/2-inch of thick end is opaque when gently flaked with pairing knife, 7-9 minutes. 5. Remove fish from oven, spread each fillet evenly with mustard and press bread crumb mixture onto fillets. Return to lower rack and continue broiling until crust is deep golden brown, about 1 minute longer. Use spatula to transfer salmon to serving plates.